My kids tend to get cavities, but I don’t let them eat candy. Why? Let’s be honest, any given grocery store has tons of options for snack food. Many of these options may not be very healthy for our teeth, especially for kid’s teeth! It can be hard to buy snack food that children will eat and enjoy that won’t cause cavities. Something that should be super easy can seem very complicated. Before we get to what we are eating, let's talk about how frequently we are snacking throughout the day. Continuous grazing for hours on end puts you at much higher risk of getting cavities than if you have structured meal and snack times that last for 5-25 minutes. By having structured meal/snack times and drinking only water in between, your mouth gets to rest and maintain a healthy environment in between eating times. A healthy mouth environment means that it is harder for bacteria to cause tooth decay, which is exactly what we want for our children! When choosing snacks for our children, we need to know that candy is not the only bad thing for our teeth. Processed foods, like potato chips or cookies, and foods that are considered carbohydrates put our teeth at a higher risk of getting cavities. This is because carbohydrates contain simple and complex sugars that bacteria use to turn into plaque and acid, which in turn, makes our mouth environment more unstable and prone to decay. Carbohydrates are still something that children need because they provide energy for growing bodies, but eating them during structured meal times can lessen their negative effect in the mouth. Other snacks might be particularly sticky, such as fruit snacks, and therefore harder to remove from between teeth. These remain in the mouth longer, providing a food source for bacteria in our mouths, and making the mouth more prone to decay. 1- Does the snack contain carbohydrates (sugars or starches)? 2- How long does the food stay retained on the teeth/is the food sticky? 3- How quickly is this food eaten? 2- Doesn’t generally stay on the teeth long because it’s crunchy. 3- Usually is eaten within a five minute period. 2- Stays on teeth for a long time, especially in grooves, because it’s sticky. 3- Can be snacked on/carried around with a child for a long period of time. Overall, when considering snacking, dried fruit is a worse snack for your teeth compared to fresh fruit because of the amount of added sugar and how sticky it is. The good news is that it doesn’t get much easier than throwing some carrot sticks or apples into your bag before you leave the house! Food that contains natural sugars are always better than processed foods with added sugars. One of the best snacking foods available is cheese. This is great news for us here in Wisconsin and it is a readily available snack almost everywhere. The reason cheese makes such a great snack is that it has protective features for our mouth. It tends to keep the environment of the mouth less acidic and therefore not conducive for bacteria and decay. Even when combined with a carbohydrate snack like crackers, cheese works to protect our teeth and keep a healthy mouth environment. Almonds and cashews, which can come in a variety of flavors, are another great option for kids who crave crunchy snacks. The same can be said about fresh vegetables like broccoli, celery, or carrots, and all of these are pretty portable if you are on the go. It isn’t always easy to switch out a kid’s favorite snack food so quickly. But by limiting portions, pairing the snack with cheese, or adding a green or crunchy vegetable, the snacking will be not as detrimental to their teeth. One last thing to look out for is hidden sugars included in processed products. Yogurt is usually viewed as a healthy food, but in a 6 oz container of yogurt, there can be up to 26g of sugar! The same holds true for fruit juice, yogurt drinks and many soft drinks and sports drinks. When buying these foods, try to be aware of sugars that are added for flavoring. Try to make a habit of looking at sugar amounts in all of your food and you’ll start to be an expert at finding out where the hidden sugars are. If you do consume these types of foods and drinks, it is always best to eat or drink them in a short amount of time and avoid grazing or sipping on them throughout the day. Here is a great snack guide from The Dad Dentist for you and your children to help you pick the best snacks for your teeth. The blue column contains snacks that won’t cause cavities because bacteria cannot use them to create plaque or acid. 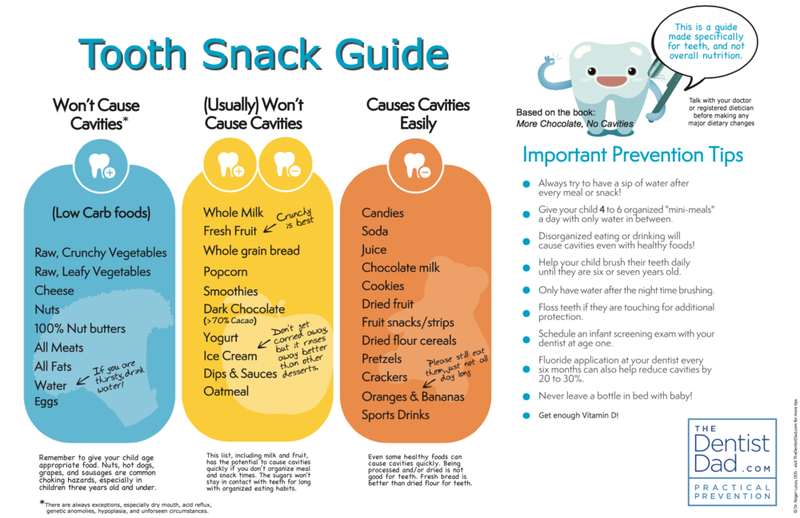 The yellow column contains snacks that generally will not cause cavities and the orange column contains snacks that put your teeth at a higher risk of getting cavities. Try to pick snacks in the blue and yellow columns, but don’t forget that an occasional snack in the orange column is okay! There are healthy foods, such as oranges and bananas in the orange column that have tons of important nutrients and vitamins … just be aware of how often these snacks are being consumed and try to drink water between all snacks and meals. If you ever have any questions about your child’s snacking habits or any concerns about their dental health, please ask. We are here to serve you!